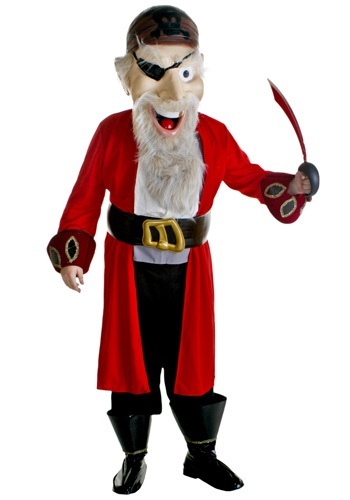 This is a genuinely unique pirate mascot costume, great for entertaining at a party or themed event! This Pirate costume comes with black polyester pants that have an elastic waist for a comfortable fit and easy movement. The grey shirt is attached to the jacket. The jacket cuffs are a burgundy with oval accents and gold cord trim. The patent boot covers are black with gold accents around the ankle. The head is a really fun part of this costume; it is over sized and detailed with a skull bandana, eye patch, large gold ring in his left ear a gold tooth painted on and of course the classic beard! Finish off the look when you add the white jabot that attahces behind the neck with velcro and the pirate belt with an over sized bronze buckle!